On Sunday 8th September 2013 Cleethorpes Seafront saw the first annual North East Lincolnshire recovery walk. The walk was to celebrate the achievements of people in recovery from substance misuse and at the same time have some fun. Staff from The Junction and NELCAT together with members of the service user group ASPIRE did a fantastic job. The team worked hard and managed to enlist the help of ‘ASDA’ who helped with the food and ‘The Community Games’ who provided some funding in the form of a grant. A big thank you must go to these two organisations. 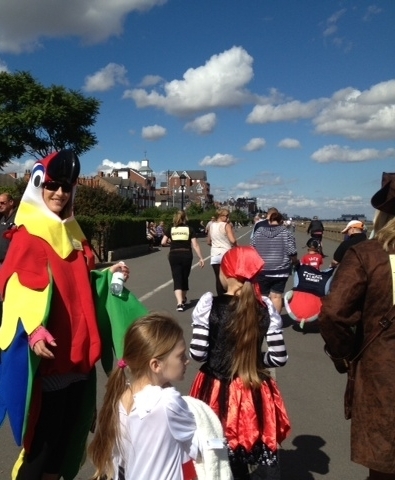 The walk was fancy dress with a Maritime Theme and it was good to see so many brave people turn up in costume. Beginning at the Beachcomber in Cleethorpes the route took the walkers along the seafront and down the promenade to Wonderland and back, a total of 6 miles. The event was a great success with in excess of 70 people turning out. People had come from as far away as Hull and there had been a bus chartered from Scunthorpe to bring walkers through for the day. Even MeShell the Recovery Turtle made it – although she did struggle with the walking but, in the true spirit of recovery communities help was on hand to support her through the journey. If you want to see the room rockin’ then click here for a short video clip. A big thanks to everyone who took part. Changing the way we talk about people who use drugs or alcohol can benefit them and society as a whole.